The militaristic (one could easily say fascist) design is easy to criticize, and it has been. 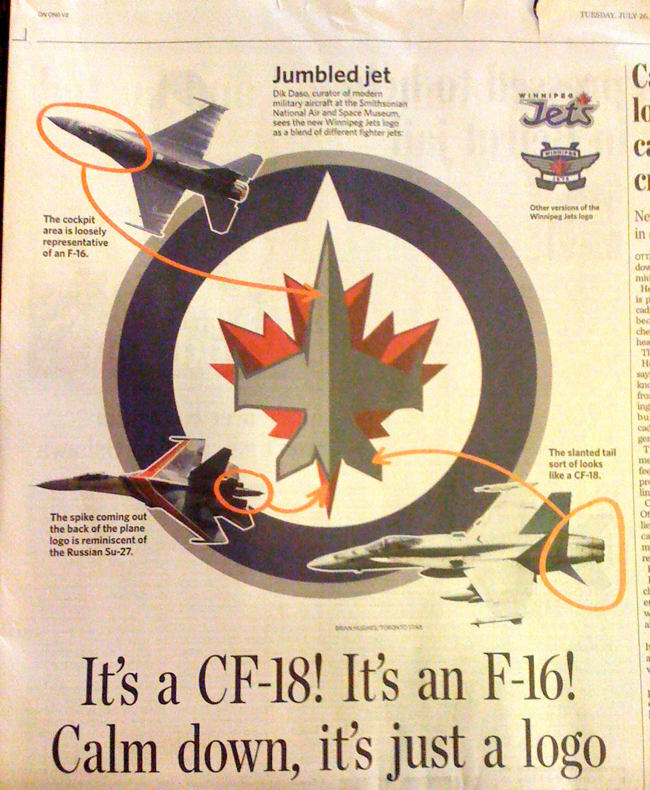 The logo looks like a CF-18 and in fact it was vetted by the Department of National Defence, which did not respond to a question about how much control it had over the design. (Admittedly, I gave them a long deadline and they are a government bureaucracy.) I assume nothing was allowed to happen without DND’s approval, but I can’t confirm that. The whole thing looks like it was drawn with vector tools, which it surely was. Nothing says cheap like Illustrator gradients shading. Nobody has bothered to point out that this is yet another case of a corporation believing that a new logo improves the company. Only graphic-design ingénues are impressed by corporate logos as such. Where’s the rest of your graphic design? Where are your typography; your layouts; your letterhead; the typeface you print letters on letterhead in; your style bible; your matching Web site; your Twitter avatar; your favicon? A logo is one step in a process and a rather unimportant one at that. A logo isn’t the culmination of anything. Actually, what Morphy was “agree[ing]” to do is conceal the identity of the designer, designers, or lead designer. I interpreted that as an indication the designers were ashamed of their work and didn’t want their names associated with it. More charitably, they are mere cogs in a corporate machine and are nameless, as individually irrelevant as the civilians whom CF-18s bomb. Too harsh? Agree to disagree. Who really designed the Jets logo? A Reebok publicist told me “Dominique Fillion is our lead designer for NHL uniforms.” I mailed Fillion to ask if he actually worked on the Jets logo and in what capacity, then suddenly got a message back from the original publicist politely insisting everything go through him. In interviews. Fillion has talked about his role in vague terms and, elsewhere, refused to say anything at all.